Cholinergic Urticaria Causes: What Causes Cholinergic Urticaria to Develop? What causes cholinergic urticaria? At this time, scientists and researchers do not know why cholinergic urticaria develops, or the exact causes. On this page, you can learn some reasons some suggest it may develop, and you can also understand what physiological processes are happening during an attack. What is the Physiological Process During a Cholinergic Urticaria Reaction? What Happens in the Body? At this point in time, researchers are aware of the mast cell involvement, involvement of acetylcholine, the hypothalamus, and histamine during a reaction of cholinergic urticaria. So it may help to first understand these individual components, and then we can see how they interact during a reaction. This article will contain basic information about these processes. The hypothalamus is a portion of the brain that contains a number of small nuclei with a variety of functions. Some functions include: Regulating body temperature, hunger, thirst, fatigue, and more. The hypothalamus is directly responsible for actively monitoring our body temperature. This is analogous to a thermostat being responsible for an air conditioner unit. It controls and monitors the temperature. The hypothalamus is very much like a thermostat for the human body. When we get cool, our hypothalamus sends a signal to shiver (which makes us warmer by using energy). When we get hot, our “thermostat” (hypothalamus) sends a signal to our body to cool down. Our bodies “cool down” by releasing sweat from tiny glands located all over the body. When this sweat is released, it produces a cooling effect by allowing evaporation on the skin’s surface. Sweat can significantly cool the body. The hypothalamus strives to maintain a consistent internal body temperature (known as homeostasis), which is typically around 98.6 degrees Fahrenheit. When our hypothalamus senses an increase in body temperature, it sends a signal to other receptors, which ultimately initiate a sweat response. When our hypothalamus senses the increase in temperature, it sends an impulse down our neurons to activate the sweat glands. These signals travel down through a network of neurons located throughout our bodies. When this signal reaches the end of each neuron in the network, a neurotransmitter (acetylcholine) is released, which causes the next neuron to transmit the signal. For reasons currently unknown, this release of acetylcholine seems to cause mast cells surrounding the tissues in the skin to degranulate. Mast Cells: What Are They? A mast cell (or mastocyte) is a resident cell of several types of tissues and contains many granules rich in histamine and heparin. Mast cells are considered part of the immune system. These mast cells are deposited in most tissues in our body, such as the skin, lungs, stomach, sexual organs, and so forth. When our hypothalamus sends a signal down our nervous system to sweat, the chemical neurotransmitter being released somehow causes our mast cells to degranulate. Histamine is a chemical created and stored by the mast cells. Histamine increases the permeability of the capillaries to white blood cells and other proteins, in order to allow them to engage foreign invaders in the affected tissues. When our mast cells degranulate, the histamine inside of the granules is released. This leads to immediate allergic symptoms: flushed skin (increased warmth/redness), extreme itching, small hives, and a stinging “prickly” feeling. The histamine is what leads to the very uncomfortable prickly and itchy feeling during a cholinergic urticaria reaction. This rapid degranulation leads to a widespread histamine release in the skin tissue near the sweat gland region. The release of histamine activates an inflammatory response in nearby tissue almost instantly, creating a very uncomfortable itching, stinging (prickly) sensation, along with flushing, and small pinpoint hives. The attack can generally be aborted if the individual rapidly cools down the body, which stops the signals from being sent to activate the sweat glands. If the body is cooled off manually, then there is no need for the hypothalamus to initiate sweat. 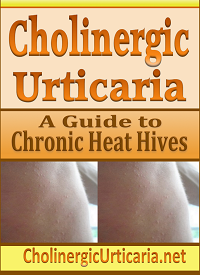 Strangely, once the body actually begins to sweat (which is difficult for most individuals with cholinergic urticaria), this reaction also seems to cease. However, individuals are not always able to “sweat it out” and pass this phase of hypersensitivity. Also, some individuals can experience multiple reactions per day. Why Does the Human Body Have This Histamine Release & Response Anyway? At this point in time, researchers and doctors are not sure why this process causes mast cell degranulation. There have been many hypotheses introduced into why cholinergic urticaria may develop in the first place. Unfortunately, these are merely “educated guesses” at this point, with very little research to support any ideas. For the research done thus far, researchers have not been able to identify the exact mechanisms responsible. Much more research is needed so the exact cause can be understand as to why cholinergic urticaria develops initially, and how it may be more successfully treated. Hormonal imbalance: Some suggest there there could be a problem with hormone production or secretion. This is leading to a complex biological problem in which the body is becoming sensitive to a natural biological process (i.e. sweating). This hormone imbalance could be the result of diet, stress, lack of vitamins, lack of sun exposure, undetected tumors, or other reasons. Vitamin Deficiency: Some suggest there could be an unknown vitamin deficiency (such as Vitamin D or others), which has caused the condition. Auto Immunity: Some suggest that cholinergic urticaria may be a type of acquired “auto immunity” in which the body is becoming sensitive to it’s own natural chemicals. Some studies suggest a simple allergy could be related to the sweat (or chemicals in the sweat). Some type of Allergy or Intolerance: Some suggest there may be an underlying (unknown) allergy or intolerance to something in the diet or environment, causing increase an increase in IgE production. Unfortunately, we will not have the answers to these questions until more research and attention has been given to this medical condition. In the future, hopefully scientists can understand exactly what mechanisms cause cholinergic urticaria to form. This may subsequently lead to better treatment options for those suffering with the disorder.